EBPI works closely under the direction of the Department of Behavioral Health and Recovery, to propose and evaluate policy solutions for challenges facing EBP implementation at the state level. Over the last two years, EBPI and DBHR have focused on developing clear guidelines for EBP reporting as well as appropriate monitoring and counting of EBPs from the state billing database. As five regions will be transitioning to Managed Care Organizations, the Health Care Authority (HCA) released the Evidence-Based Practice Codes FAQ to help clarify the instructions for reporting EBPs in the new system. To access the FAQ, please click here. For more information regarding SERI Codes and Service Encounter Reporting, please contact us or visit the HCA website. The EBP Reporting Guides provide written direction to providers for when it is appropriate to report an EBP for mental health services. It employs a research grounded and innovative approach to monitoring EBPs for state level reporting by directing providers to use the essential elements of clinical treatment types as the basis for documentation rather than fidelity to name brand treatment programs. Click the picture on the left to view the 2019 Reporting Guides. Click here for some commonly asked questions on the Reporting Guides and the use of EBPs. EBPI recorded the Reporting Guides Workshop has be rolled out across Washington State. You can view the workshop here. 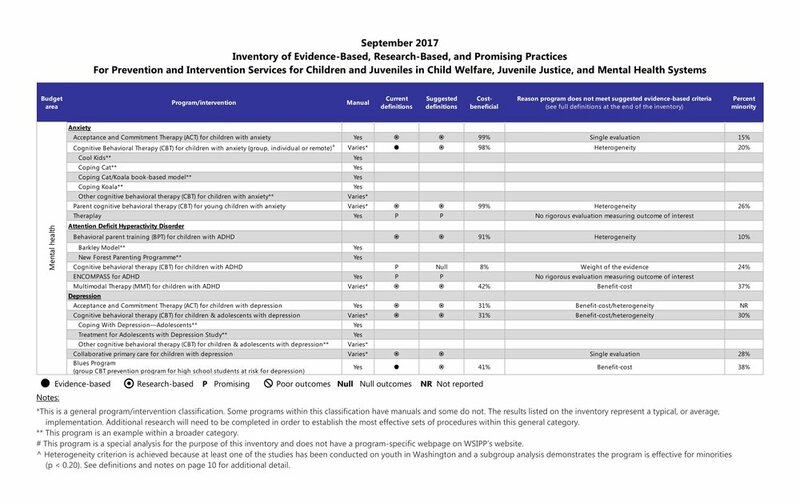 To view the 2018 Washington State Institute of Public Policy’s (WSIPP) Inventory of Evidence-Based, Research-Based, and Promising Practices For Prevention and Intervention Services for Children and Juveniles in Child Welfare, Juvenile Justice, and Mental Health Systems, please click here. To apply for promising, research-based, and evidence-based practice, please click here.